Philanthropy, floristry, garden design and antiquities are just a few of the host of things that make up who Ed Merrin is. Sparkling white marble was carved into “minimalist” sculptures of figures — predominantly female — as well as vessels and other objects in the third millennium BC in the group of Aegean islands called “the Cyclades”. We now know that the figures were not as deceptively reductive as they appear today, as they were originally painted, at least with facial features, if not overall. So, like the sculptures of Greece and Rome that mostly survive in pristine monochrome, Cycladic figures have come to represent an aesthetic — in this case, modernism — that differs from that of their creation. When such objects were first discovered, in the 19th century, it was their starkness that made them reviled. However, it is a happy accident that their streamlined forms seem to prefigure styles of 20th century art, as they have come tobe embraced, appreciated, collected, and preserved as a result. Some figures retain variations in surface preservation in the outlines of long-gone paint. These barely visible details are called “paint ghosts”. Various styles evolved on different islands through time. These styles have been given names such as “Speedos variety”, “Dokathismata variety”, “Plastiras type”, etc. Also, individual artists’ styles have been discerned and where that occurs, the anonymous artist has been granted a name, usually based on the name piece’s modern collection location. Cycladic figurative sculptures range in size from miniature to life-size. The production of the largest figures suggests that well-organized and stratified societies. The most frequent type is a female with arms across the midriff. The breasts and the pubic triangle — the essences of fertility — remain visible. Thus, some scholars believe that the figures are representative of a mother-goddess or fertility cult. The feet are rarely in a flat position that would permit the sculptures to stand upright. Rather, the feet are usually pointed. Thus, the likely disposition of the figures was in a reclining position, something that encrustation analysis supports. What do the figures mean and how were they used? Those questions are still being investigated. But as with all ancient artifacts that are not purely functional or decorative, cult and ritual practice, religious worship, afterlife intercession, or ancestor reverence are all possible rationales for the creation of these magnificent works. 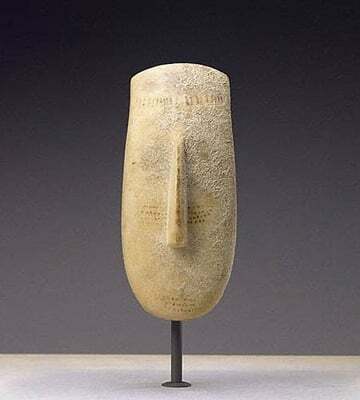 Cycladic art has long been a key favorite in the Merrin Gallery’s collection and, as the New York Times reported in 1989, Ed Merrin caused quite a stir in the market. The New York Botanic Gardens is publishing a book on the arrangement of flowers by Edward Merrin with photos by Ismael Ramirez. It is a book of 250 arrangements, and will be of coffee table size. This volume will be the start of a series of publications. It will be available in August 2011, to hit book stores for the full run for the Christmas season 2011. Founder and former owner of New York’s Fifth Avenue Merrin Gallery, Edward Merrin has, together with his wife Vivian, been at the forefront of garden design, flower arrangements, and other nature-inspired pursuits. The Merrin couple are also avid philanthropists, having recently made donations to aid financial programs at Tufts University for students who otherwise would not be able to attend. Edward Merrin has been involved with various charities, NGOs, and other organizations for his whole life; notably the Infants’ Home of Brooklyn, the American Jewish Joint Distribution Committee (AJJDC), Childville, and the American Friends of the Israel Museum (AFIM). The availability and specific details of the flower arrangement publication will follow shortly. Please watch this space. Wishing everyone a happy New Year. May 2011 bring your dreams to life!